Overview: In order to manage apps and data on district Mac and iOS devices, every secondary student and staff user in SVVSD will need to create and maintain an Apple ID account that is linked to an email address. *It is not advised to have more than one Apple ID account used on one device. Option 1: Use an existing Apple ID or create an Apple ID for both school and personal use. Option 2: Create an ID with a SVVSD email for use on district only devices. Review the following charts to determine which option is best for you. create a new Apple ID to use with both personal and district devices. syncs to your device doesn’t violate the SVVSD Responsible Use Policy. Both apps you have purchased AND apps provided by your school will show up as part of your Apple ID purchase history on your district iPad. Music and movies you’ve purchased personally will show up as part of your purchase history on your district iPad. If you have apps purchased under your personal Apple ID, you can easily download them onto your district iPad without having to pay for them again. Even though you’re using a personal Apple ID, any paid apps you download through Absolute Apps will be revoked when you are no longer employed by the district. Apps you’ve purchased that aren’t appropriate for school use will show up on your purchased apps list on your district device. Unless you deselect the option in Settings > iTunes and App Store to automatically download new purchases, these apps and media purchases will appear on your district iPad. Photos or videos you take with your iPad or another personal iOS device (such as a phone) will show up as part of your photo stream. Your personal photos will be synced onto your district device by default. If you’re not comfortable with this, you must go to Settings > iCloud and deselect the option for photo sync and photo share. If you use iCloud for backups, you’ll see backups for both your district and personal devices within your backup list. During the original setup of your district iPad, you will want to pay special attention to the Settings > iCloud options and turn off any items you don’t want to be synced with your district iPad. Other apps such as iBooks and Keynote have specific settings options that control their ability to sync. Go to Settings > App Name to manage their sync settings. Apple provides only 5GB of iCloud data storage for free. Because your iPad has 32GB of storage, you may quickly run out of iCloud storage space if it is enabled. Only apps provided by your school will show up as part of your Apple ID purchase history on your district iPad. If you wish to load an app or music you purchased with a personal Apple ID, you will need to either repurchase the item OR log out and into your personal Apple ID to download the purchase. Doing this more than three times in a 90 day period may lock the iPad from additional account changes. THIS IS NOT RECOMMENDED AND MAY CAUSE ISSUES WITH ACQUIRING APPS FROM THE DISTRICT. Even though you’re using a new district­only Apple ID, any paid apps you download through Absolute Apps will be revoked when you are no longer employed by the district. Any apps, music or movies YOU purchase using your district email account will continue to be owned by you, but cannot be transferred to another existing Apple ID in the future. If you leave the district, you can change the associated email, but it must be changed to an email address that is not already associated with an existing Apple ID. Only photos and videos you take on your district iPad will appear in the Photos app. 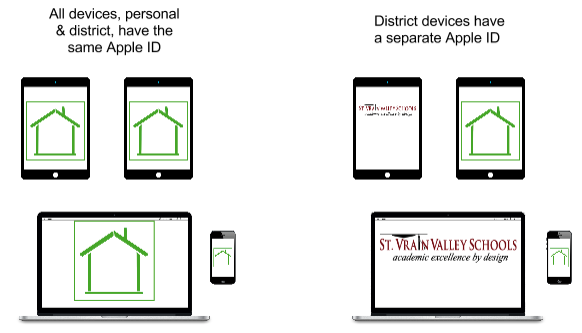 Having a separate Apple ID for your personal device and an Apple ID for your district device may help prevent personal images, video and data from appearing on your district device. If you use iCloud for backups, you’ll see backups for only for your district device. Switching between a personal and a district only Apple ID and iCloud account may cause you to lose documents and data if they are not backed up and synced before you switch accounts. Switching between a personal and a district only Apple ID and iCloud account will require you to reactivate Find My iPad each time you switch accounts.